Cloudberry Online Backup doesn’t quite follow suit with other online computer backup solutions like Carbonite, as in it’s designed specifically for use with Amazon’s S3 storage system, Cloudberry helps users manage their online file storage and bolster their backups for $30. When using Cloudberry Online Backup, you’ll be able to schedule your backups, encrypt the contents of your backups and if disaster strikes, you can restore your computer to how it was at a particular date to keep things as simple and efficient as possible. When you open Cloudberry, you’ll be presented with a tabbed interface which allows you to select from the welcome screen; your backup plans; online backups and your backup history. I found the interface to be extremely intuitive as a first time user, and quickly got used to the layout of the program. Setting up a backup plan is extremely simple — on the welcome page there are two buttons to select from titled “Setup Backup Plan” and “Restore Backup”. To the right of the page, you can see an overview of your backup, including how much space you’ve used and a list of your backup plans. To commence with setting up a plan, you can select the ‘Setup Backup Plan’ button, which opens a window guiding you through the backup process. You can continue to select the backup source from the open explorer window. After selecting the folders and files that you wish to back up you can also select an “Advanced Filter”. This will allow you to backup either all of the files in the folders you previously selected, or you can filter and backup files that only match specified criteria. You can choose to backup files of only a certain type and choose not to backup files or a certain type (I found it useful to exclude my video files, as they were substantially large). Once selecting the file types and folders to backup, you can also go further, and compress the backup to reduce the amount of data being backup up to Amazon. This is a crucial feature, as when using the Amazon S3 backup solution, it costs more depending on the size of your backup. For the first 50TB being used, it costs $0.15 per GB, so if you’re backing up a significant amount of data, the compression feature of Cloudberry is crucial. As if this isn’t enough, Cloudberry also allows you to encrypt your data with a password of your choice. Once you’ve perfected your backup, you need to select the options for the purging of backed up files. You can choose to keep a certain number of backups stored or choose to purge versions older than a specified number of days (you can choose however many days to keep backups for) or just keep with the default settings of the product, which can also be edited so you don’t have to type in the purging settings every time you back up. After completing the settings, you can schedule the backup to occur automatically, which I recommend — it makes the whole process extremely simple so you don’t have to worry about it! After naming your plan, your backup is good to go. Select finish and your backup will begin. So you’ve got everything backed up — now what? Hopefully, nothing! Nobody wants their data to disappear, but if it does then you can get everything back with little hassle (if not a lot of bandwidth!) When choosing your restore, you can choose the latest version or a point in time depending on from when you wish to recover your data. You also have the option to select a specific folder(s) to restore if you haven’t lost all your data. After choosing where to restore the files to, and if required, decrypting the backup, all your data is downloaded to your hard drive and you’re good to go again! 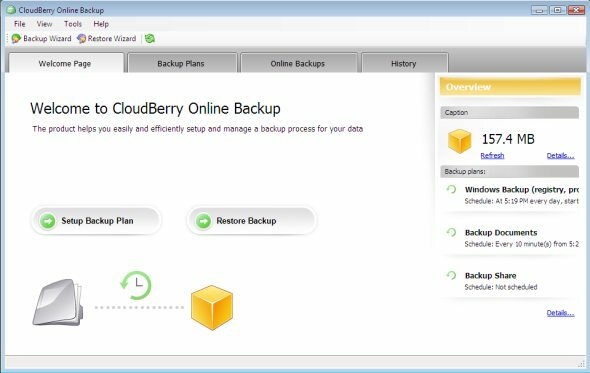 Cloudberry Online Backup is extremely easy to use and manage, and I have no hesitation in recommending it to individuals or small businesses to use with their Amazon S3 backup solution — worth every penny!